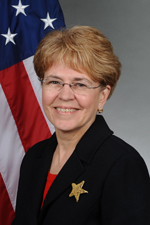 NOAA Administrator Jane Lubchenco announced yesterday in a email letter to staff that she is leaving the federal agency at the end of February to return to academia and her family in Oregon. She has served at NOAA for nearly four years and presided over additions by the Obama administration to the 2008 hydro BiOp that governs federal dams on the Columbia and Snake rivers. In her email, she listed 20 areas where she considered notable progress had been made, including, "setting a stronger course for endangered species conservation in places like California's Central Valley and the Columbia River and in the ocean, e.g., for coral conservation"
Lubchenco was a well-known marine ecology professor at Oregon State University before she was tapped for the top spot at NOAA. She has earned many scientific honors over the course of her career, has served as president of the American Association for the Advancement of Science and won a MacArthur "genius grant" some years ago.